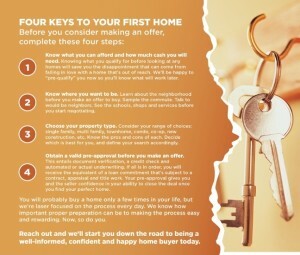 Before making an offer on your first home, make sure to complete these four steps. Knowing what you qualify for before searching for any homes will save you time and disappointment that can come from falling in love with a home that is out of reach. Getting pre-qualified for a loan will help you understand your numbers and affordability. Learn and research the neighborhoods you’d like to live in, drive through the neighborhood different time of the day and week. Check out the schools, shops, crime rate and talk to the neighbors to learn more about the area. Based on your goals and lifestyle, the area of where you buy a home is curial. There are many different property types, single family residents, condos, multi-family, townhomes, new constructions, etc. learn and know all the pros and cons about each property type in your area. Again, your future goals and plans will play a role in your decision. If you are looking to expand your family or use the property for investment in the future could change your choices on type of property you would buy. Finding a right mortgage lender and obtaining the pre-approval is the initial steps of searching for a home. Loan pre-approval means your lender has reviewed all the necessary documents and verified with the underwriting to make sure they are efficient for you’re to receive a commitment letter. There still may be other documents and verifications such as appraisal, title work and home owners insurance that has to be obtained but at least you know that the money is secured for your financing. Buying a home is one of the largest investment most people make in their lives, and we know how important such a decision is for you and your family. We would love to be part of that process and walk you through it step by step.